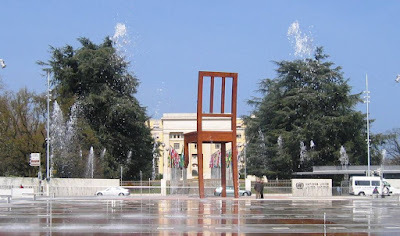 I visited the UN office in Geneva last week, but I forgot my camera. So I went back today to take pictures. And it's a good thing I waited because they just installed a new fountain in front of the official entrance. 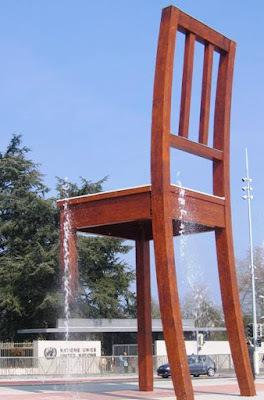 The three-legged chair is a reminder of the destruction caused by land mines. It was installed about a month ago. This is the official entrance for diplomats... Everyday visitors use a side entrance. 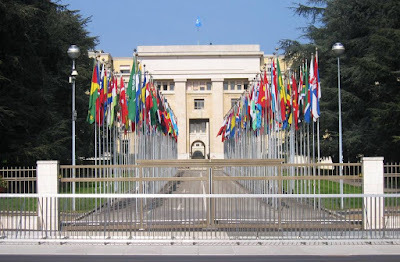 The office in Geneva is the second-largest UN office (the largest being New York). Over 3,000 offices are housed on the grounds, and the main building is larger than the palace of Versailles. They keep peacocks on the UN grounds as a matter of tradition... seven currently live at the Geneva office. There were originally fourteen, but they had a fox problem for a while. Apparently these peacocks can scream very loudly. I am told that it is a sound that I would not care to experience. As the story goes, one day a very important meeting was being held in the main conference room (you know, the huge one they show on TV). This conference room has a window that opens on a view of a tree. And in this tree on that particular day, a peacock got stuck. It screamed so loudly that nobody could hear the speaker, so they had to stop the conference to go outside and get it down. I can just imagine the headlines... "World Peace on hold for Peacock"!